Food Protein Ingredients Market size was over USD 17.25 billion in 2016 and industry expects consumption of above 5.5 million tons by 2024. Consumer inclination towards health management supported by availability of wide variety of wellness products will drive the market size. Global wellness supplements market was valued at over USD 185 billion and is poised to surpass USD 245.5 billion by 2024 with gains at over 6.5%. Proteins are the building blocks of human body which are synthesized from amino acids and found mainly in hair, akin, bone, and tissues. These ingredients are categorized in animal and plant-based additives. Growing importance of daily dietary supplement intake in the form of pre-& post workout replenishment as a muscle building ingredient is likely to have positive influence on market growth. Supporting regulatory amendments by FDA pertaining claims for nutritional content on dietary products labels supported by acceptance of pea-based products as safe additive for bakery products, soups, snacks, beverages, soups, instant milk mixes, nutritional bars and processed meats will positively impact industry growth. European Food Safety Association has specified the daily population reference protein intake for infants, adults, children, pregnant and breast-feeding women. Daily intake for stated for adult men ranges between 67g to 114g per day and 59g to 102g per day for women. These regulatory norms would boost product consumption thereby promoting overall demand. Growth in infant’s food products demand owing to increased affordability along with rising economic standards across the globe. Global baby food market was valued at over USD 55 billion in 2016 and may exceed to USD 75 billion up to 2024. Increase in number of working women has led to rise in demand for readymade baby products due to lack of time and hectic lifestyle which is likely to drive baby food industry growth, thereby stimulating product demand. Shift in preference towards peptides due to easy digestibility will favour industry growth. It helps in reducing infantile colic syndrome along with facilitating muscle and bone structural development in infants, thereby promoting food protein ingredients demand. Fluctuating prices of plant-based ingredients due to high dependence of production on seasonal variations along with use in various other industries including biodiesel, pharmaceutical and feed may cause supply crunch which may hamper industry profitability thereby affecting the market prices trends. However, rapid technological innovation to develop novel formulations will favour industry growth. 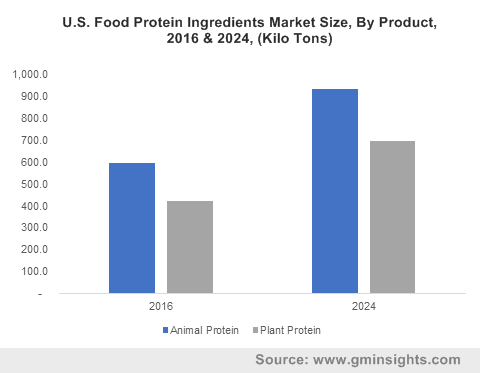 Animal-based food protein ingredients market size may surpass 3.25 million tons at the end of 2024. Rising investments in livestock feed to improve productivity and yield has led to development of high quality animal derived products including eggs, meat and fish which will contribute towards product demand. Technological advances in meat processing and rendering industry may act as another driving factor for industry growth. Plant- based food protein ingredients may witness strong gains at over 6.5%. Growing vegan population along with rising concerns regarding livestock disease deteriorating animal derived peptides quality along with environmental issues has led to increasing adoption of plant-based ingredients. Plant based products have superior characteristics such as allergen and gluten free, non-genetically modified organism and are certified as organic, which help in improving muscle thickness promoting their demand over animal derived products. Pea protein products is likely to grow significantly owing to its rich content of lysine and arginine which helps in reducing cholesterol by converting fatty acids to energy, reducing heart issues, anemia, reproductive disorders and nausea. Rising threat of coronary heart disease due to stressful life and sedentary work is likely to stimulate food protein ingredients demand. Food protein ingredients market size from sports nutrition application is anticipated to surpass USD 13.90 billion over the forecast timeframe. These supplements has prominent application in sports nutrition to gain muscle strength, repair tissue, enhance workout recovery after high intensity work out and maintain and increase stamina which is likely to fuel product demand. Availability of varied premium brands of wellness supplements supported by growing consumer spending on dietary products should favour industry growth. Food protein ingredients market size from bakery products may observe substantial gains at over 5%. New product development including whole grain, low trans-fat, less fat, multigrain, and organic products, are expected to impart growth to the industry. Functional additives in bakery products helps in increasing extensibility and elasticity of the bakery products along with rising consumer adoption. According to International Food Information Council 65% of the consumer look for protein content on the label while purchasing the products thereby contributing towards industry growth. Asia Pacific driven by India, Japan, South Korea and China market is estimated to exceed USD 5.65 billion over the forecast timeframe owing to rising consumption of dietary supplements. Easy and large availability of plat based raw material due to presence of agro – economies in this region supported by dominance of vegan population may drive regional growth mainly for plant-based additives. However, growth in animal derived products demand owing to decreasing cultural and traditional barriers mainly in China, Japan and India will promote animal derived food protein ingredients demand. Europe driven by France, UK, Italy and Germany market may register strong gains over 6.5%. Favorable regulatory norms by EFSA improving daily nutrition intake may promote region industry growth. In addition, growth in development of industrial livestock to maintain food security and protein supply all over region may promote industry growth in this region. Brazil market may witness steady gains due to increasing demand for convenience and ready to eat food for infants owing to rising disposable income along with growing consumer health consciousness should promote regional industry growth. Global market share is consolidated and highly competitive with major players operating in this industry includes ADM, Cargill, DuPont, Bunge, and Mead Johnson. Other prominent companies include Fonterra, Tessenderlo, Scoular, Rouseelot, Burcon,Nutra Science, Kewpie Egg Corp, Roquette, and Crop Energies, Bio Wanze. 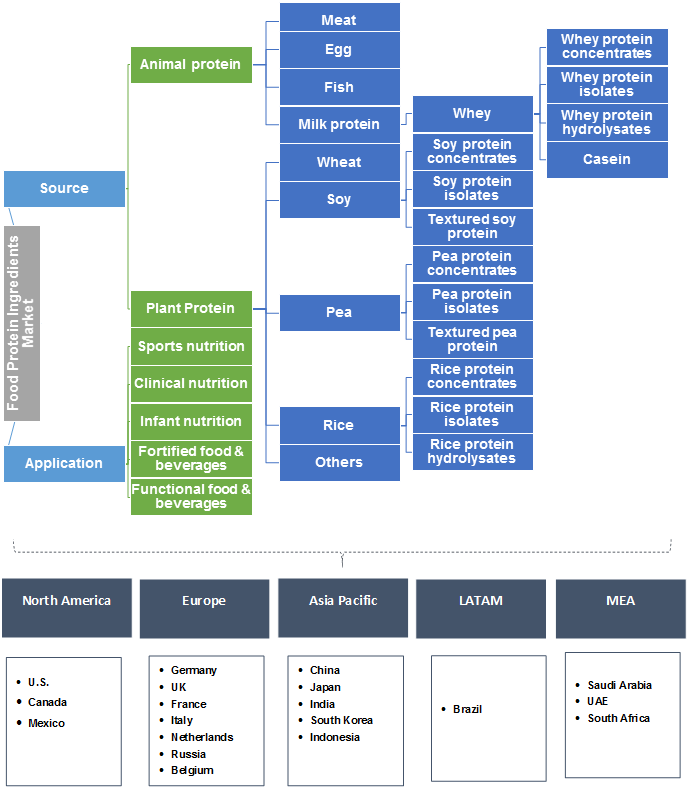 Major industry participants are investing in product innovations to develop novel preparation catering growing protein demand. Companies are innovating products by combining more than one protein to achieve desired effects. In addition, the industry is characterized by strategic alliances such as capacity expansion, mergers and acquisitions which may surge industry growth. Proteins are the power house of human body which helps in carrying out normal body functions by building muscle strength and supplying required energy. It helps in form hormones, new tissues, antibodies and enzymes. Increasing usage in nutraceuticals and health supplements on account of high calorie intake to reduce risk of chronic diseases such as diabetes, cancer, hormonal issues and heart disease may stimulate industry growth. Moreover, key players are adopting technologies to formulate isolates and concentrate form to achieve effective delivery and action.